Maitake mushrooms, scientifically known as Grifola frondosa, are native to the mountains of northeastern Japan. Roughly translated, maitake is Japanese for "dancing mushroom." People are said to dance for joy when they find one because of their value and health benefits. They can be cooked and eaten with many foods and can now be found as dietary supplements and powders. Recent research is showing their many immune system and anticancer benefits. Maitake mushrooms contain a polysaccharide fiber called beta glucan. The beta glucans in maitake mushrooms works to activate and increase production of certain immune system cells such as macrophages, T-cells, natural killer cells, and neutrophils. These cells can help the immune system to more quickly and efficiently fight against illness. This can increase your resistance against sickness and disease, help your body remove cellular wastes, and speed up recovery from tissue damage. The beta glucans in maitake mushrooms help to activate and produce white blood cells called macrophages. Macrophages work in the body to ingest and destroy tumor cells. This can help to make chemotherapy more effective. Maitake mushrooms are also shown to lessen the side effects of anti-cancer drugs by decreasing nausea, vomiting, and hair loss. According to a study by Keiko Kubo and Hiroaki Nanba, a decrease in blood glucose levels is observed in mice given doses of maitake mushrooms compared to a control group. The researchers believe that the mushrooms may work to decrease insulin resistance thereby increasing insulin sensitivity. Intake of maitake mushrooms can help to decrease blood pressure levels, lower total cholesterol levels, and help maintain weight which can all help to promote heart health. The mushrooms are found to be low in calories and high in fiber which can increase satiety and feelings of fullness. Feeling full faster can help to decrease overall food intake resulting in weight loss and maintenance. A study by Yokota gave 30 overweight adults daily doses of maitake mushrooms without changing any other aspects of their diets. At the end of the 2-month study, participants lost an average of 7 to 13 lbs. 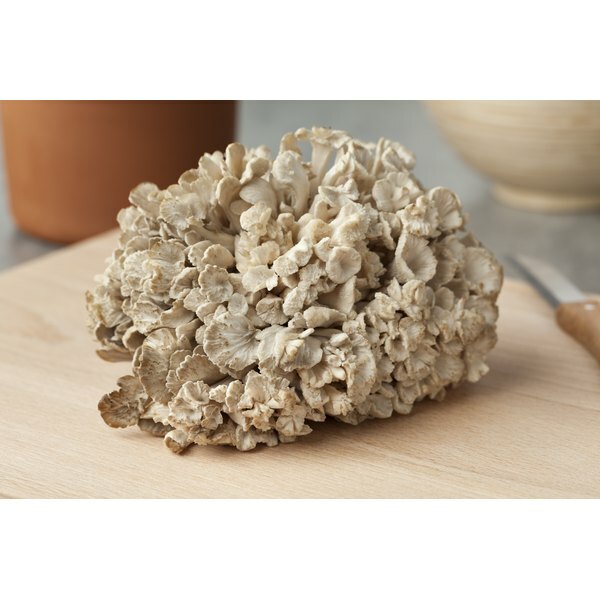 American Cancer Society: Maitake Mushrooms. "Mushroom Biology and Mushroom Products"; Anti-Diabetic Mechanism of Maitake (Grifola frondosa); Keiko Kubo and Hiroaki Nanba; 1996.